One of the most prolific and outstanding guitarists in the Bay Area. Never one to play it safe, Michael composes complex and exciting arrangements from his vast musical background in jazz, Latin, funk and rock. Michael LaMacchia, was born in Kenosha Wisconsin, than moved to San Francisco at 18 and began his musical career. He has explored styles including, brazilian, jazz, african, latin, classical and pop. He has a special way of bridging these worlds musically togeather, creating a special sound that is personal and passionate. A gifted guitarist and a prolific composer there is always a buzz in his music, a feeling of freshness and passion. He has played with many of the Bay Area's/Worlds finest musicians, Alan Hall, Scott Amendola, Paul Van Wagenigen, Jim Ogios (Cheryl Crow, Counting Crows), Deszon Claiborne, Lex Reazon (Vinyl), Todd Sickafoose, Derek Jones, Dan Fieszli, Sam Bevan, DannZinn, Matt Renzi, Jon Arkin, Mark Bernfield, Matt Huelitt, Andy Stohler (Tracey Chapman), Kim Nalley (Pearls), Sandy Griffith, Drew Young, Edo Castro, Niels Mryner, Steve Bennett, Taylor Cutcomb, Andy Dillard, AureaFernandez. Michael has also appeared at many of the Top Festivals and Clubs, Yoshi's, Kimball's, Kumbya, Great Americian Music Hall, The Sweetwater, Concord Jazz Festival, North Beach Jazz Fesitival, San Jose Jazz Festival, just to name a few. Michael is also known for his beautiful poetry, song writing, studio & production work & Music Development Program (Crossroads). 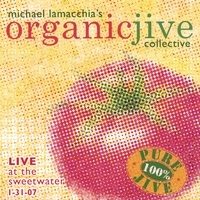 Michael LaMacchia and his Organic Jive Collective. One of the most prolific and outstanding guitarists in the Bay Area, Michael LaMacchia and his Organic Jive Collective. Never one to play it safe, Michael composes complex and exciting arrangements from his vast musical background in jazz, Latin, funk and rock. With four original CD’s to his credit, Michael is releasing a live CD recorded at Sweetwater this year featuring Michael and his Brother Joe’s original material as well as unique arrangements of songs the band covers. This Is The First CD put out by Michael Featuring 5 Great vocalists.